**NEW PRODUCT** I remade this product to include more unique words. NOTE: "fart" is no longer used in the cards. 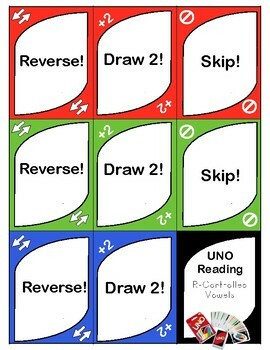 R Controlled Vowel Uno is a great way to get kids to practice their r-controlled vowels AR, UR, OR, ER, and IR. With 135 UNIQUE R-CONTROLLED VOWEL WORDS and six "Wild Cards" with r-controlled sentences, this game is packed with replay value and fun for everyone. As the reading specialist for my school, all the students look forward to playing this game. It sure beats worksheets! Print and laminate to make this resources last for years! I have included a chevron background on the final page for double-sided printing which ensures the pages not see through so that players cannot see each other's cards. Enjoy! The first player (normally the youngest player) views his/her cards and tries to match the card in the discard pile based on color or number. For instance if the discard pile has a red card that is a 2 you have to place either a red card or a card with a 2 on it. If the player has no matches they must draw a card from the draw deck. Each time a player places a card on the discard (in play) deck, she must read the words on the card aloud. If she cannot read the word, she can ask another player for assistance. There are different ways to play regarding drawing new cards. The way I suggest playing is that the player must draw one card from the draw deck. If the player draws the desired color/number she can play the card, if she cannot it is the next players turn. The moment a player has just one card in her hand she must say UNO. If she is caught by another player, the player who has UNO must draw two new cards. Once a player has no cards remaining, the game is over. 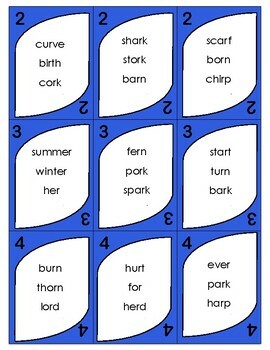 I typically teach the student to say “Uno Out” as they play their last card. Cards: Besides the number cards there are several other cards that help mix up the game. “Reverse” – If going clockwise, switch to counterclockwise or vice versa. 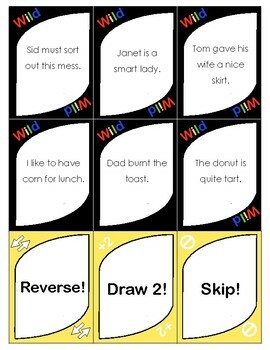 “Skip” – When a player places this card, the next player has to skip their turn. 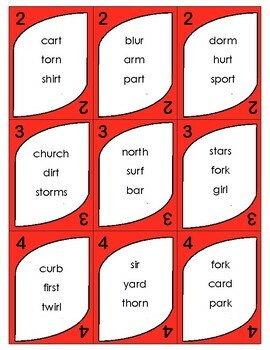 “Draw Two” – When a person places this card, the next player will have to pick up two cards. ” Wild” – This card represents all four colors, and can be placed on any card. The player has to state which color it will represent for the next player. It can be played regardless of whether another card is available.